As cool as they may be – you can keep your Gremlins, Silent Night, Deadly Night, Die Hard, Christmas Evil and Santa’s Slay. 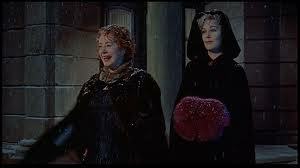 1958’s stylish, witchcraft laden Bell, Book and Candle is the perfect yuletide holiday film (with a genre bent). 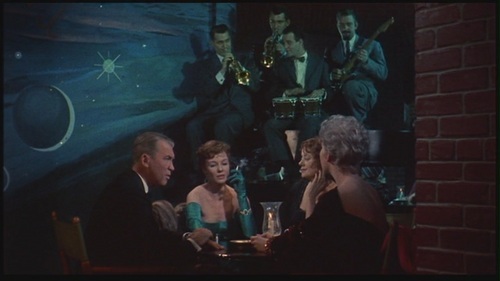 With a nice portion of the proceedings occurring on Christmas Eve and Christmas, this tale of Gillian, a beguiling witch who falls in love with a mortal, is not only full of romance in the traditional sense, but director Richard Quine, also, establishes a love affair with the audience and the idea of winter in the big city. He and art director Cary Odell create New York City streets full of moody lighting, soft streaks of snow and glorious cavalcades of historic apartment buildings. It’s dreamy. 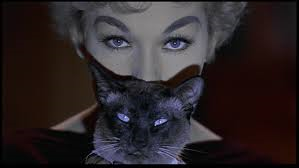 As Gillian, the divine Kim Novak is, also, in her arched eye brow prime here. She and James Stewart, her co-star in that same year’s classic Vertigo, establish a believable chemistry despite their age difference and Novak definitely compels in the mystical sense, as well. This is truly one of her finest performances and the layers she provides here ring with believability and otherworldliness. With stalwart comic support from the always reliable Elsa Lanchester and the fluidly magnetic Jack Lemmon, as members of Gillian’s family, this tale has just enough references to the occult, along with plenty of spellbinding directorial mood-craft, to make it a must-love for all well rounded fans of horror.